While searching for innovative ways to teach and promote peace building, I came across an organization that not only achieves these goals, but that also allows young people to explore their creativity. Mentoring Peace Through Art is a Minneapolis based non-profit organization founded by Jimmy Longoria and Connie Fuller. The organization develops art projects aimed at elementary to high school kids throughout the diverse and troubled areas of Minneapolis. They provide the children with opportunities to explore their artistic and creative abilities while promoting peace. “MuralWorks in the Streets” and “MuralWorks in the Schools” are the two programs made available by the organization. 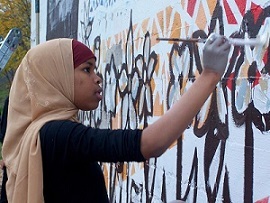 “MuralWorks in the Streets” takes teens to the streets to make over walls ruined by gang graffiti by replacing them with beautiful, colorful art. According to the organization’s website, they have successfully remade 11 walls across the city as of 2012. MuralWorks in the Schools brings art projects into elementary schools to teach children peace through activities that promote teamwork. Each project assigns individual students with tasks that contribute to a final product. These programs not only teach young people about team work and the power of art, they also help keep them away from unlawful activities and guide them in positive directions. The efforts made by the organization can help to identify, engage, and promote future leaders while bringing peace to the community. When, where and in what setting can these programs be used? I believe that the ideals of Mentoring Peace Through Art and its programs can be applied to any educational setting. Since the main goals of the organization are to promote peace and build cooperation, any member of a community can take part in creating murals and art projects. The great thing about these programs is that they use a tool that is accessible to everyone, art. Allowing people to work together and express their individual creativity while creating artistic pieces that are representative of the community is the perfect way to teach peace. Since these programs have been successful with children and teens in troubled areas, there is a likelihood that it can be successful for people of all ages in various parts of the world. How these programs can be implemented? To implement these programs and really make sure they’re beneficial, educators should have strong connections to their communities and their community leaders. They should be well-connected in order to identify areas that need attention and intervention. Additionally, good relations with community leaders can help in gaining the support of the community as a whole. Educators should also be knowledgeable about art in order to develop projects that successfully promote positivity and peace. Strong leadership and communication skills are also important. Several of the seven pillars of peace education can be applied to these programs. Community-building, skill-building, engaging multiple intelligences, and nurturing emotional intelligence can be used with these programs. For example, by engaging people’s creativity, the art programs are able to focus in on engaging multiple intelligences as well as nurturing emotional intelligence. 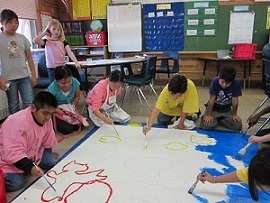 Through the art programs, both children and adults can gain artistic, social, and team-building skills. In addition, they can learn to appreciate their communities and understand the importance of strengthening them. Although the programs offered by Mentoring Peace Through Art can be beneficial for all, there are two groups they can be especially beneficial for. I think that they can be used by people of troubled areas all over the world. For example, community leaders and educators from cities with violence can take advantage of this program and prevent young people from following those violent paths. Since children are impressionable, educators can implement art programs to show them that they are capable of achieving anything. The programs can open their eyes to the possibilities they have before them. Another group that may benefit are adults who have struggled with the law. I think that these programs can be turned into rehabilitative resources for them. To prevent violence in troubled areas, it it also necessary to give attention to the sources of the violence. The programs can serve not only as outlets for these people but also as resources that allow them to build friendships and connections.